The Oldsmobile 442 was Oldsmobile’s entry in the “Supercar” wars of the mid-sixties and early seventies. Although it was never as lauded or as popular as the Pontiac GTO or Dodge Charger, it outlived many of its rivals and helped pave way for Oldsmobile’s ascendancy in the 1970s. This week, we look at the history of the Oldsmobile Cutlass and 442. Back in the benighted days of the seventies and early eighties, the best-selling nameplate in America was not a Chevrolet, a Ford, or even a Toyota, but the ubiquitous Oldsmobile Cutlass. In 1977, the division’s best-ever sales year, Oldsmobile sold 1.1 million cars, about 675,000 of which were Cutlasses of one sort or another. The Oldsmobile Cutlass was not the world’s most attractive design, nor was it outstandingly quick, economical, or luxurious, but it was a competent middle-of-the-road car and it sold like mad. It was not always so. The Cutlass got off to a disappointing start in the early sixties and for much of the decade, it was overshadowed by its A-body cousins, the Chevrolet Chevelle/Malibu and Pontiac Tempest/Le Mans/GTO. It was not until the early seventies that it began its remarkable ascent. The first Oldsmobile Cutlass was a 1954 show car, a plastic-bodied fastback with a louvered rear window and dramatic fins. It took its name from the U.S. Navy’s Vought F7U Cutlass fighter, which entered squadron service around the time the show car debuted. The Cutlass show car was not GM’s prettiest design, but it was quite racy, something that could not be said of contemporary Oldsmobiles. The original Olds Rocket Eighty-Eight of 1949-1950 had been the darling of hot-rodders and stock car racers, even winning the first Carrera Panamericana rally, but since then, Olds had succumbed to middle-age spread. By the late fifties, the Oldsmobile brand was most easily defined by what it was not: not as sporty as the new Pontiacs, as posh as a Buick, or as prestigious as a Cadillac. An Oldsmobile was a big, soft, conservative car, aimed at middle-class buyers with little interest in performance or ostentation. In the late fifties, the United States suffered a short but severe recession that began in the fall of 1957. Auto sales were hit hard, particularly middle-class brands like Buick and Oldsmobile. Many buyers turned to compact imports; Volkswagen sales rose to more than 120,000 units in 1958, causing considerable alarm in Detroit. In response to the recession, General Motors decided to invest heavily in compact cars. The first would be the Chevrolet Corvair, followed a year later by a line of “Senior Compacts” from Pontiac, Oldsmobile, and Buick. All would share a new unitized body shell, known internally as the Y-body, and a new 215 cu. in. (3,528 cc) aluminum V8, co-developed by Buick and Oldsmobile. Despite the recession, Olds management was not convinced that they needed a compact car. Although Oldsmobile sales had taken a 22% hit in 1958, they recovered handily for 1959 and Oldsmobile customers were not exactly crying out for a smaller car. Chief engineer Harold Metzel had considerable doubts about the unitized Y-body, preferring the greater isolation of body-on-frame construction. Everyone was worried about the new aluminum V8, which was expensive to build and strained the corporation’s manufacturing technology to its limits. Left to its own devices, we’re not sure that Oldsmobile would have built the Y-body at all, but the corporation was already committed and development went forward at a brisk pace. The F-85 was the smallest car Oldsmobile had offered since 1932, nearly two feet (60 cm) shorter and more than half a ton lighter than the division’s contemporary full-size models. Prices started at less than $2,400, about $450 less than an Oldsmobile Dynamic Eighty-Eight. Standard power was Oldsmobile’s version of the 215 cu. in. (3,528 cc) aluminum V8 with 155 gross horsepower (116 kW). Despite its smaller size, the F-85 drove much like the big Oldsmobiles of its day, with a soft ride, slow steering, and a near-total aversion to enthusiastic driving. With the optional Roto Hydra-Matic, it was capable of 0-60 mph (0-97 km/h) in a bit over 14 seconds seconds, a top speed of 102-103 mph (164-165 km/h), and up to 22 mpg (10.7 L/100 km) — reasonable if hardly startling. By the time the senior compacts appeared, the economy had recovered and even compact car buyers were turning to sportier, more luxurious models like the Chevrolet Corvair Monza. Late in the 1961 model year, Oldsmobile launched an upscale version of the F-85, a coupe with bucket seats, better trim, and a 185-horsepower (138 kW) version of the small V8. The coupe was dubbed F-85 Cutlass, taking its name from the earlier show car. Although the F-85 was practical and reasonably attractive, early sales were disappointing, totaling around 80,000 units for 1961. The principal problem was price. An F-85 Deluxe four-door sedan, the most popular model, cost almost as much as a full-size Ford Galaxie. Worse, the aluminum engine proved to be every bit as troublesome as Oldsmobile engineers had feared, driving up warranty costs. The other Y-bodies weren’t faring much better. 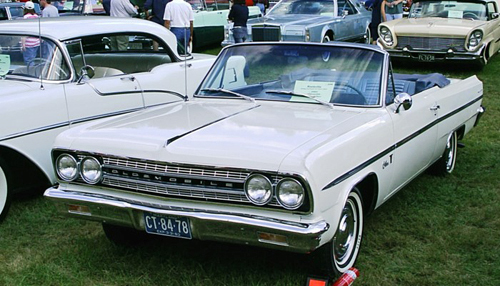 The Buick Special sold fewer than 87,000 units for 1961, well below expectations. Pontiac’s four-cylinder “rope-drive” Tempest was doing somewhat better thanks mostly to its lower price, but it was expensive to build, so its profit margins were slim. By mid-1961, the Senior Compacts were starting to look like a miscalculation. Although they weren’t small except in a relative sense, they lacked the size and gravitas that shoppers of GM’s mid-price divisions had come to expect. The Y-bodies’ technical novelty, meanwhile, provided little obvious benefit while making the cars too expensive for shoppers looking for a plusher economy car or midsize family sedan. The latter point was underscored by the continued success of Rambler, which was No. 3 in U.S. new car sales for 1961 thanks mostly to the popularity of the roughly Y-body-size Rambler Classic, and the introduction that fall of Ford’s midsize Ford Fairlane and Mercury Meteor sedans. The Fairlane was a bit bigger but hundreds of dollars cheaper than the F-85 or Buick Special even with its new compact V8 engine. Consequently, the Fairlane outsold the 1962 Oldsmobile F-85 and Cutlass by about three to one, as did the 1962 Rambler Classic. It didn’t take long for GM group vice president Ed Cole to get the message. In early 1962, he decreed that rather than continuing to struggle and trip over one another in the now-crowded compact market, Buick, Oldsmobile, and Pontiac would drop their Y-body cars after 1963 in favor of a new line of intermediate models. The new cars, which would share the new A-body shell of the forthcoming Chevrolet Chevelle/Malibu, were to be far more orthodox than the Y-bodies, allowing Buick, Oldsmobile, and Pontiac to offer more car — if not necessarily more space — for less money. We’ll actually be talking about the Hurst/Olds next week. Nice article. I always liked the Cutlasses from the 1960s and 1970s. The 4-4-2, in particular, always seemed to be a cut above other muscle cars in sophistication and substance. What Olds didn’t seem to get in the 1960s was the importance of marketing and image. The cars were usually as good as anyting else out there, and in some ways better, but the division’s image was far too staid, at least until the Toronado came along for 1966. In 1965, for example, Pontiac ads were shouting about GTO Tigers and using very stylish artwork to make the cars seem even longer, lower and more glamorous than they really were. The television ads were just as effective and carried the same message. Meanwhile, log on to youtube.com and enter “1965 Oldsmobile commercials,” and you’ll be treated to a series of black-and-white ads featuring a stern, short, middle-aged, balding guy barking out the attributes of the 1965 Oldsmobiles. He looks like a typical crabby high school principal. Hardly a great way to cultivate a “with it” image during the go-go years of the mid-1960s. In the 1970s, Oldsmobile really hit its stride. My parents faithfully bought Oldsmobile Delta 88s. Oldsmobile hit the sweet spot during those years with people like my parents. They didn’t want a Chevrolet or a Ford (too common), but a Cadillac or a Lincoln would have been too ostentatious. Pontiac seemed to be adrift without any real image, aside from the Trans Am, and respectable suburbanites did not dream of baiting the police in a black-and-gold F-body. Meanwile, many younger people were buying the Cutlass Supreme coupes. They were considered quite stylish during the day. In some ways, for people of a certain age, it’s still hard to believe that Oldsmobile went away. But then, we would never have believed that GM could go bankrupt, either. [quote=pennsycarfan]What Olds didn’t seem to get in the 1960s was the importance of marketing and image. The cars were usually as good as anyting else out there, and in some ways better, but the division’s image was far too staid, at least until the Toronado came along for 1966. You’re absolutely right, and it’s important to note that Oldsmobile advertising is exactly what GM corporate management thought their marketing should be like. Pontiac’s aggressive approach gave Jim Roche and Fred Donner (GM’s chairman and president in that period) absolute fits — they were constantly making angry calls to Pete Estes and later John DeLorean, telling them to tone it down. DeLorean said Roche particularly hated the tiger theme. By 1967, the corporation demanded that Pontiac show them all ad spots before they ran, trying to keep it in check. Once DeLorean left in early 1969, subsequent Pontiac management was much more acquiescent, which is why (as you note) Pontiac’s image was sort of adrift in the seventies. When I was a kid, we owned a 1962 F85 4-door up until 1977. It was a fine car, but the generator charging system just wasn’t reliable. I remember changing brushes on the generator several times with my father and the voltage regulator a few times as well. The 215 V8 was a great engine. We never had any problems with it. The induction sound was intoxicating. Someone actually offered to buy the car to use the engine for racing. The model we had was basically a stripper. Manual steering, manual drum brakes, manual windows, no air-conditioning. Nothing. Just an engine, transmission, body, 4 doors and that’s it. As far as the transmission, I could have sworn it was a Turbo Hydramatic. I remember many fine summer days driving with the windows down and enjoying the wind in my face. 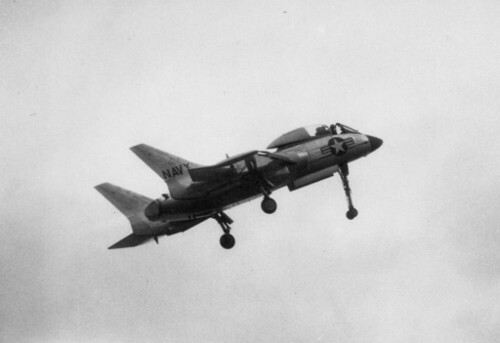 The 1961-1963 F-85 and Cutlass used the Model 10 Roto Hydramatic. Other than the name, it had nothing in common with the later (and far superior) Turbo Hydramatic. The Roto Hydramatic was essentially a scaled-down, simplified version of the old dual-coupling H-M, removing the front planetary gearset (cutting it from four speeds to three) and fluid coupling and adding a stator to the second coupling to make it a torque converter. The Turbo Hydramatic was also a three-speed torque converter automatic, but the similarities ended there. The THM used a Simpson gearset, and its operation was very different. It was also positive and durable, which could not be said of the Roto Hydramatic. I own a 64 f-85, has a 308 with center console,tach, and bucket seats. Two door. Can’t find any information about this car. Any thoughts? A stock ’64 F-85 or Cutlass would have a 330 cu. in. engine (with either 230 or 290 gross horsepower, depending on carburetion); that was the only engine available that year. If it has an Olds 307, it’s the result of an engine swap — the 307 was a much later derivation of the Olds small block, introduced in 1979 or 1980. Olds did have 308-degree [i]camshafts[/i] for both the small-block and big-block engines; it was used on the W-31 engine a few years later. I’m not sure if that cam would work with a 330, but I wouldn’t be surprised. The buckets, console, and tachometer were all regular production options, so there’s nothing particularly unusual about those. The 1967 white “442” with blue stripes is a clone and a poor attempt. 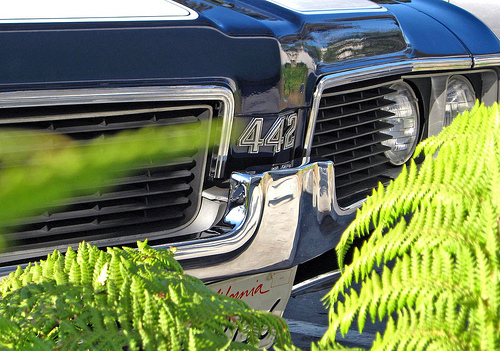 A true 442 has a non-functional louvered hood, blacked out tail light surrounds & trunk strip and the grille bar on the cutlass model was the thick one pictured here. Sorry, I spent allot of time researching them whilst looking for one for my dad to restore. Okay, thanks. I’ve amended the pictures and captions; I don’t have other photos of the ’66-’67 4-4-2 to replace them with at the moment, although I’ll looked to do that in the future. As the bean counters slowly usurped the reins of GM, marketing became even worse as was demonstrated in the 90’s with their ad “This is not your father’s Oldsmobile”. It certainly wasn’t. That was a 442 and your grandfather’s was one of the Rocket 88’s with all their racing accolades. It showed how little marketing pinheads knew about the history of their own company. Not surprising, it was the first to get the ax. So, Pontiac’s next and I guess it’ll come down to one car, probably Chev, which will be nothing but a Toyota with Chev decals. Just stumbled upon your site recently (a reference from TTAC), and I have to say, I’m hooked. I see you also have an article about the Hurst/Olds, but what about the forgotten Olds factory hot-rod, the Rally 350, often referred to as the “executive’s hot rod”? I owned a ’69 442 from 1979 to 1981. My car was equipped with the 400 C.I. V-8, Muncie “Rock Crusher’ 4 speed with factory Hurst shifter, 3.73 12 bolt positraction rear end and the Tick-Tock-Tach. The ’69 442 was a torque monster and a pretty good handling car for its size. I autocrossed the big Olds very successfully against Mustangs and Camaros since the Olds was always bumped up to the pony car class. The Olds had a hard life before I bought it. I straightened out the body and painted it Charcoal Gray to offset the Dark Red interior and Black vinyl top and finished it off with black stripes. I sold the car to a 16 year old in the fall of 1981. The last time I saw the car was in Youngstown, Ohio around 1985. It is one of the few cars I wish I’d kept. top. It came equipped with tri-power and a four speed. I think it had a hurst shifter. It was used when I bought it. It was my corvette,road runner eater. It was extremely fast and also a great road car. I got into a lot of trouble with that car. Never lost a race except against my buddy’s 57 chevy with a 454 tunnel ram. Top speed was over 130 mph as recorded by the highway patrol. Possibly the best car I ever owned. Still miss that car! I bought a ’67 Cutlass Supreme , 330 c.i. , Super Fast on top end . I totaled it @ 6000 miles and put the engine in a race car . It was sold as a ” Dimonstrator” Head parts from a 330 wouldn’t fit , had to use 455 parts . In 1968 the W-31 , 350 c.i. came out . What is this engine , all matching #’s , excellent condition worth ? Sorry, I’m wholly unqualified to appraise either engines or cars — not my area! You give short shrift to the 1968 version of the Cutlass, which is a shame–those cars 9esp. the versions from 69-71) were quite remarkable. The first car I ever bought was a used 71 Cutlass coupe. It was a fantastic car–smooth, fast pick-up, surprisingly crisp handling, and a comfortable ride. It was the the perfect road trip car, and more fun than bigger vehicles. The 69-71 Cutlasses and Skylarks were legendary for their reliability and durability. The bodies sometimes were undermined by salt (mine wasn’t for some reason), but it was not unusual for people to get 125-150K miles out of the drivetrains, which was quite novel for US cars of that era. Mine was totaled in a relatively low speed accident (no damage to me) with over 100K miles, but I never owned a car that so well combined power, comfort and handling until my 1999 Passat which lacked the Cutlass’ reliability and durability. Those cars also had really classic styling in the coupes (the 4 doors had more awkward proportions–Chevy did a better job with those). The next generation cars were not only less well built, they just seemed bulky by comparison. Except for an unfortunate typo (which I just fixed), I’m not sure how the ’68 Cutlass is shorted here, since it has a whole section of an article on the whole run. I just didn’t have any photos of the ’68 at the time of writing. I’ll freely admit I’m not a fan of the looks of the 1968-69 A-bodies, although I do think the 1968 Oldsmobile Cutlass is the best-looking of the bunch. I agree that the two-doors look better than the four-doors (as with a lot of cars from the ’60s and ’70s, one gets the impression the two-doors were done first and the sedans were an afterthought). I’m looking at a 1963 F85 cutlass convertible that claims to have an original 394, 345 hp. 440 ft. lbs. torque engine. I cannot find anything to support this engine being offered as an option in this car. Only available in the dynamic 88 or police cars as I see it. Any thoughts on this? The 394 was never a factory option in the F-85 or Cutlass and certainly not in 1963. Even when Oldsmobile had authorization to off an engine bigger than the 330, they went for the new 400, not the relatively elderly 394. So, while there were occasionally odd factory one-offs built for VIPs or favored customers, that one sounds unlikely. Is it actually a 1963 Cutlass? The most obvious explanation would be that somebody is misreading the VIN (which changed format after 1963) or something like that. I can’t advise you on modifications and repairs, sorry! I apologize if this has been covered, but two of the differences in a 442 compared to GTOs and SSs and GSs were the rear sway bar, which every 442 hack (and became common later on Chevelles with the F-41 suspension), and the “convertible”frame, which every 442 had at least thru the 60’s. Instead of being just an open inward facing “C” channel in the middle, the perimeter frame rails had an additional slightly smaller “C” channel nested inside with the opening facing out, giving you a “fully boxed” frame, a ” boxed girder”. Far far stiffer for a minimal weight increase. Used on convertible, taxi’s, and police cars – and all 442s. The convertible frame was an option on 64/65 Chevelle sedans and hardtop, and it was cheap, but very few were bought and it wasn’t an option after 65. I’m a Chevy guy, but the difference the frame made can’t be overemphasized. I have a black 1975 442 Cutlass with a built up 455.The car is a larger and heaver than the 1964 – 1972 cutlass, doesn’t look as classic ether. But does have it’s good points.It is a more modern driving car than the older years.Because of the stronger frame better steering, factory disc brakes and rally suspension.It is also more aerodynamic and comfortable at speed.Belive it or not this cutlass body style has aged well,with the chrome and the curvy body.The factory white stripes look great on the black body.The black interior has swivel buckets also.It is to bad Oldsmobile only made 6,227 in 1975.About 2% of cutlass sales.It is a overlooked fun big blocked car from the 70’s. The Colonnades had their faults, but the chassis really was much improved compared to earlier A-bodies. The earlier 442 was, in some respects, more a mitigation of the flaws of the midsize A-body chassis than anything else; “less bad” as opposed to “more good.” I’m not much of a Colonnade fan from a styling standpoint, but I will agree that with the right combination of trim and color, they can look pretty sharp. Appreciate the article! I own one of the 148 F-85 Base Club Coupe 442s from 1964. Bench seat, vinyl floor, four on the floor. Why did GM ban multiple carburetors? I’ve heard they can be hard to service and with low sales it might have been difficult to train mechanics to warranty fix them. Or maybe because they don’t add much power, just for looks. My experience with cars of that era is that their is much more power to be gained on the exhaust side than the intake. Most cars had very restrictive exhaust manifolds, so more carbs didn’t help much until you installed headers. But then you had to tune all those carbs all over again. Have you read anything about why they banned them? My favorite line in this article is about how offering multiple carbs really threw off the 442 name. If it were just a matter of sales or of feeling like there wasn’t much benefit relative to a big Quadrajet, I imagine it would have been left to the discretion of the individual divisions. I don’t know exactly what the rationale was for the corporate edict, but from the timing, I assume it was either 1) not wanting to appear to promote performance too much (a constant GM corporate preoccupation in this period); 2) concern about meeting emissions requirements, which were already in effect in California and about to take effect federally the following year; or 3) some combination of the two.